00:06 Today we'll have a look at the cool new refactoring features of Xcode 9. Back in the Objective-C days, we actually used AppCode's refactoring a lot. It changed the way we wrote our code: instead of copying and pasting lines, we used the refactoring system to extract expressions and methods and to create variables and properties. 00:52 Now with Xcode 9, we're getting a glimpse of what this way of working can look like. But the refactoring features are still in beta, so they don't always work perfectly. Therefore, it's good to have your project under version control. 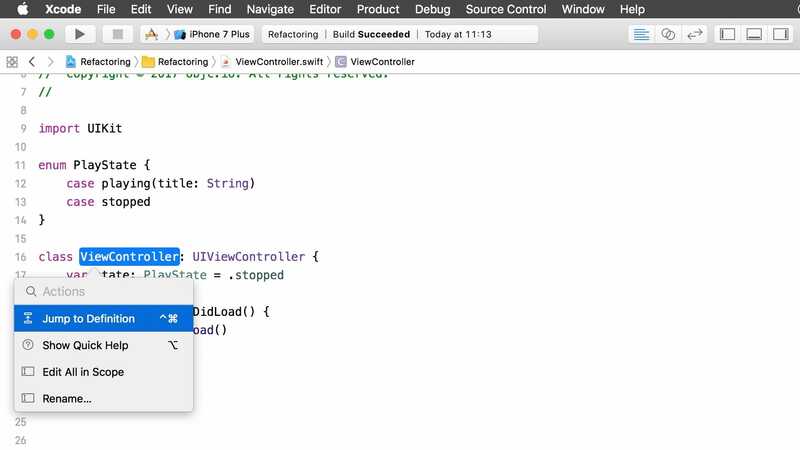 01:38 When we choose the Rename option, Xcode shows all the places where ViewController is used or mentioned, including the filename and the storyboard reference. It even shows that the file header's comment block mentions ViewController. This mention of the name in the comment block is initially greyed out, but when we click it, it'll also be replaced. 02:07 Now we can type a new name, like PlayerViewController. When we build, we find out something went wrong: Xcode updated the file reference in the project, but it failed to rename the actual file. This shows that the system isn't completely stable yet. 04:19 If we prefer to only use the keyboard to extract the expression, we could select the expression and press Cmd+Shift+?. This opens the Help menu search, in which we can simply start typing "extract" and then navigate to the correct menu button using the arrow keys. This Help menu shortcut works universally on macOS. 05:01 As an even quicker alternative to using the Help menu, we can assign a custom shortcut. In Xcode's preferences, under Key Bindings, we can search for "extract expression" and assign a unique shortcut, say Cmd+Option+Ctrl+E. This is handy if we use the menu option a lot. 08:00 If we add a new case to the enum, we can use the fix-it again. 08:21 You can also use the Cmd+Shift+A shortcut on the switch statement itself. This gives you more naive options to add a blank case or a default, without any knowledge of your enum. 09:07 Another useful bit is that you can press the Cmd key and hover over your code with the mouse. This highlights the scope, which makes the structure of your code visible. When clicking with the Cmd key pressed, you get the same Actions menu as with the shortcut Cmd+Shift+A. 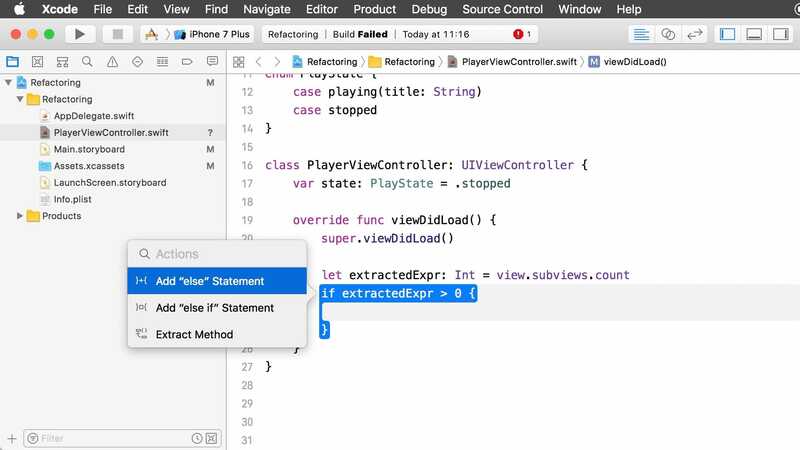 10:11 Xcode moved the switch statement into a new method, extractedFunc, and added a call to this method at the line where the statement used to be. Of course, we can easily rename the method to printState via refactoring. 11:22 It makes sense that Xcode uses an inout parameter, since we're writing to the result variable. Xcode doesn't make unnecessary copies; it just writes to the variable in place. 11:57 In the future, maybe we'll have a way to let the compiler refactor the code to result = extractedFunc(). We can also try to add this custom refactoring ourselves in a future episode.